Harrogate parkrun was run in reverse on Saturday to give the seven Striders in attendance something a little bit different to think about as they made their way around the Stray! Dan Foley kept his bearings and finished in a time of 21:33, followed just over a minute later by Rob Earl (22:49). David Halladay (23:09) was the third Strider across the line and was joined by Jen Carne (28:12), Mark Taylor (29:59), Rob Charlesworth (31:40) and Joanne Gray (37:59). The hills of the Temple Newsam parkrun course greeted six Striders. With the fantastic café calling out to be visited, James Wright clocked 20:58 and was swiftly followed by Gary Wilkinson (25:29), Mark Shelton (29:27), Edna Wood (30:42), Annika Mcdonald (33:57) and Emma Hall (39:02). Saturday afternoon saw the annual running of the Yorkshire Cross Country Championships at Lightwater Valley Theme Park. Like some of the rides at the venue, the 10km course is up and down, with some tight turns to contend with also. The clubs sole representative this year was Sean Brennan who completed the course in 50:08. The 3rd race of the 17/18 PECO Cross Country series was held at Roundhay Park on Sunday morning. Cold conditions didn’t put off fourteen hardy Striders from attending. Sima Lowery was the first yellow and blue vest back in 36:35 followed very closely by Sean Brennan (36:46) and Nicola Carter (36:47). Club Chairman Jez Wilkinson was across the line just under 3 minutes later (39:27) and following him was Ian Mitchell (40:08), Baz Roger (41:46), Georgina Townsend (43:16), Sue Morley (44:10), Paul Heywood (45:17), Kez Welsby (48:08), Debbie Goldfield (49:52), Edna Wood (50:28), Dawn Richardson (53:03) and Laura Wilmshurst (55:29). Our annual awards night will be held on Saturday 10th February at Knaresborough Cricket Club. Doors will open at 19:00 with the main event starting at 19:45. The bar will be open and a light finger food buffet will be provided. There will also be an opportunity to purchase club clothing. The main award of the night will be “Strider of the Year”, with nomination forms available at the club from Tuesday 16th January so get your thinking caps on! Our new chat forum ‘Striders Chat’ is now live! The aim of the forum is to help our members communicate with each other more easily away from the club – arrange to meet up for runs, discuss training options, tell others about a fantastic event you have attended, etc. The topics are endless so why not log on and start your own topic for others to get involved with? Follow this link to access the forum area. You will need to create a username and password prior to obtaining full access. Club Trips 2018 – Where shall we head? Over the last 3 years there have been a number of successful club trips and we want to ensure these continue into 2018. Trips have taken place to the Amsterdam Half Marathon, local parkruns, the Lake District, Equinox24 (Grantham) and Endure24 (Leeds). We are ‘opening up the floor’ for 2018 trip ideas and would love to hear from our membership of events they believe would make good club trips that cater for all abilities at the club. – combining a Lakeland Trails event (which range from 5km to 55km) with a stopover in Keswick, Ambleside, etc. At the time of writing 2 Striders have signed up for the 1/4 marathon (6.55miles) and 6 Striders have signed up for the Marathon. Both events will be held on Sunday 8th April and are still currently open for entries. Rotterdam is a practical place to visit for a weekend as there are up to 5 flights a day from Leeds Bradford Airport to Amsterdam, with Rotterdam just over an hour away on the train from there. The overnight ferry from Hull direct into Rotterdam is also an option (but departure would be needed to Rotterdam on the evening of Friday 6th April). Striders entered two teams into this event in 2017 – the inaugural event at Bramham Park – and with it been so successful, the majority of last years entrants have already signed up. Two full teams of 8 are now in place but more Striders teams can be entered – the more the merrier! We currently have 2 people on the waitlist and we would need to have a minimum of 6 to enter a further team. The basics of the event are that it is run on a 8km course between 12Noon Saturday and 12Noon Sunday. The idea is to have someone in each team on the course at all times during the 24hr event. The cost is £61.75 each which includes camping, t-shirt and medal. Toilets and hot showers are available on site alongside full catering for the duration of the event. Our next ‘Zero to Hero’ course starts in just over a week and places are selling fast. This is an eight-week programme of walking, jogging and running with the aim of being able to complete a 5K run (3.1 miles) at its completion. To this end we will finish the course by running the Harrogate parkrun on the Stray in March. The course will start on Thursday 11 January 2018 at 7pm and the cost is £15, which includes Club membership until the end of March 2018. There are only 40 places available and at the time of writing, just under half of the places have been allocated. If you would like to take part, or know someone who would like to join in, please email the club for an application form via info@knaresborough-striders.org.uk. This is always an excellent course so get signed up now! Christmas and New Year Results – Burning off the Mince Pies! Three Striders headed to the new Selby parkrun to check out the 1 lap course that takes participants around a (primarily) disused airfield. Guy found the course to be super quick and achieved an oveall parkrun PB of 17:44. James Wright followed 2 minutes later (19:43) and Edna Wood completed the course in 28:06. At Harrogate, Ian Mitchell was the first Strider into the finish funnel (20:33) and he was joined by Sean Brennan (21:28), Mark Taylor (22:17), David Halladay (23:13), Craig Mitchell (24:12), Derek Calvert (24:17), Gary Wilkinson (24:37), Mark Shelton (27:27), Anthony Everitt (28:28), Tracy Allison (30:08), Gaynor Downs (33:32), Joanne Gray (36:37) and Emma Hall (37:04). Fountains Abbey hosted its last parkrun before Christmas and welcomed five Striders. Nicola Carter clocked 21:49, followed by Dawn Richardson (32:21), Rebecca Williams (33:39), Bill Kirkpatrick (34:39) and Deborah Goldfield (41:59). In Wales, Dan Foley visited the Bryn Bach event and recorded a time of 20:06. Across the water, Tom Calvert took the first place token at the Derry City event, finishing with a time of 18:15. Christmas Day parkrunning – tis tradition! Thirteen Striders decided to get a 5km under their belts on Xmas Day (maybe to allow that one extra mince pie?!) at Harrogate parkrun. Battling against strong winds, Guy Close ran across the line in 18:53 and was joined on the Stray by James Wright (21:37), Nicola Carter (22:47), Sean Brennan (23:40), Claire Baxter (24:40 – PB), Derek Calvert (24:59), Gary Wilkinson (26:23) and Paul Heywood (27:35). Anthony Everitt chose a good day to record his 100th parkrun and ran his three laps in a total time of 28:41. The final four Striders were split by only 5 seconds with Dawn Richardson (31:10) and Tracy Allison (31:10) having a dead heat, followed by Edna Wood (31:12) and Andrea Price (31:16). On Boxing Day, Julie Elmes took on the Chevin Chase. This is an 11km route that is certainly ‘undulating’ throughout! Julie completed the event in 01:18:13. The weather on Saturday 30th December claimed the majority of parkruns in the local area but three Striders managed to seek out an event that was still on in order to get another parkrun in the bag. Nicola Carter flew the Striders flag at Woodhouse Moor (Leeds), completing the course in 21:41. We should also mention that Nicola recently secured her 100th parkrun – a great achievement Nicola! Gary Wilkinson headed up the A1 to Darlington South Park parkrun, recording a time of 25:25. For the 2nd Saturday on the trot, Guy Close visited the Selby event and clocked a time of 18:47 in “slippy conditons”. New Years Eve saw 15 Striders get some last minute miles into the yearly tracker across three events on New Years Eve. Sue Morley raced against Alistair Brownlee (yes that’s right – the Olympic champion) at the Auld Lang Syne fell race. She couldn’t quite keep up with Alistair (who bagged 1st place in a time of 44:54) on the 9.6km course but still recorded a brilliant time of 01:18:07. At the Jolly Holly Jog in Ripon, Ian Waller (45:13) led home the Striders contingent on the energy sapping “mud bath” course. David Halladay was just under 5 minutes behind Ian (50:05) and was followed through Studley Royal Deer park back into Ripon by Stewart Hymas (50:56), Gary Wilkinson (52:57), Claire Baxter (55:00), Anna Cornforth (01:01:58), June Graham (01:03:48), Alison Dales (01:04:22), Lisa Harrison (01:06:05), Julie Elmes (01:06:19), Katie Gray (01:10:29) and Annika Mcdonald (01:23:15). Not as local as the above two races, Dawn Richardson and Andrea Price headed over to Spain to complete the San Silvestre 10k race in Barcelona! Starting just as dark started to descend, Andrea completed the course in just over the 1 hour mark (01:00:17), with Dawn following in a time of 01:04:34. Maybe this could be a Striders trip in the future?! Happy New Year…or should that be “Happy Double parkrun day”?! We finish off our Christmas/New Year round-up with results from New Year’s Day parkruns (where known) – the only day of the year where you can record two parkrun results. Guy Close recorded his 100th parkrun at York, recording a PB at the venue with a time of 17:56. Mark Shelton, Jen Carne and Emma Hall all visited the Knavesmire based event for the first time and recorded times of 28:21, 29:22 and 38:05 respectively – a great start to the year! Nicola Carter, Sean Brenan and Gary Wilkinson headed North West to complete a ‘New Years Day double’ with trips to the Skipton and Pendle parkrun events. Skipton was the first event of the day, with Nicola finishing 3rd Lady in a time of 22:04, Sean following in 24:32 and Gary finishing in 27:15. At Pendle, Nicola completed her 105th parkrun in 23:28, Sean completed his 161st with a time of 24:10 and Gary stopped the clock on 28:08 to record his 55th parkrun. Its the Striders Xmas Party at the Swan Hotel this coming Saturday (16th December) so here is your final reminder of the details…. Please note that there are two different Xmas party events taking place at the venue on the night. The Striders are booked on the “Party Fever” event so please ask staff for directions to the correct room if it isn’t obvious. Clare and Natalie will be on hand when you arrive to provide you with a place setting card that will have a reminder of your menu choices on. As part of the Striders booking, a 1 night free stay has been provided by the hotel (this can be used, subject to availability, at any time until the 31st March 2018). Everyone who has booked on the Xmas party has an opportunity to win this free nights stay and the draw will take place before the Striders session on Tuesday 12th December. This years Xmas party is the biggest one organised to date (70 booked in) so it bodes well for a great night. See you all there with your dancing shoes on! 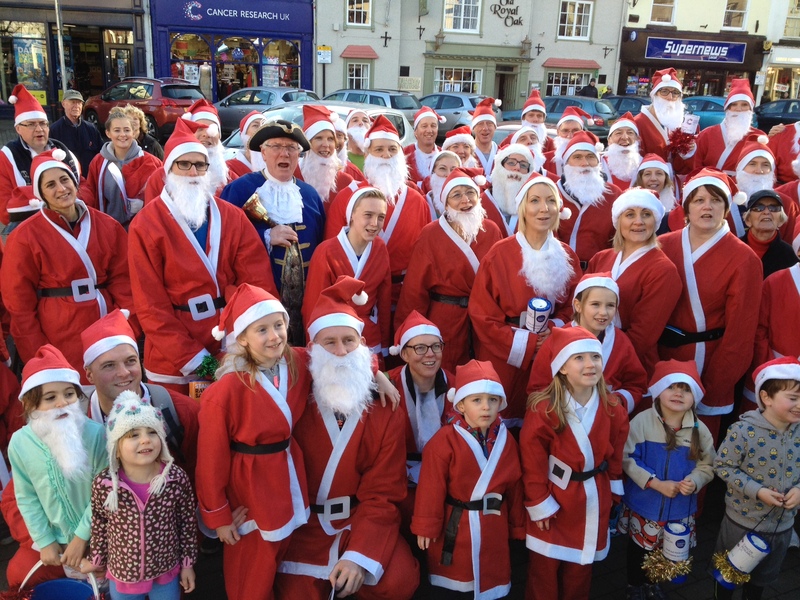 The clubs annual Santa Stride will take place on Sunday 17th December starting in the market place at 12Noon. 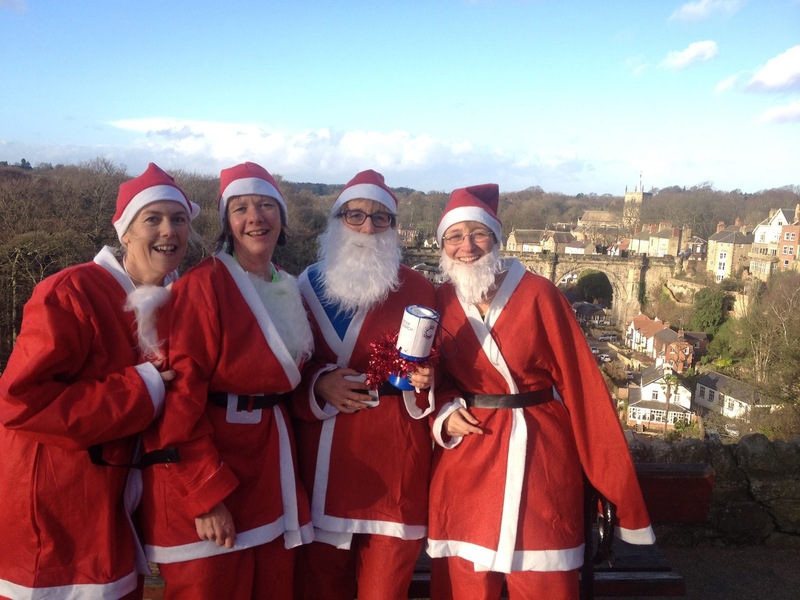 This event is for all the family, taking in a short loop of Knaresborough with carol singing stops along the way! Registration will be from 11:30am outside the Cancer Research charity shop. Santa suits will be available for a minimum of a £5 donation, with all money raised going to Cancer Research. 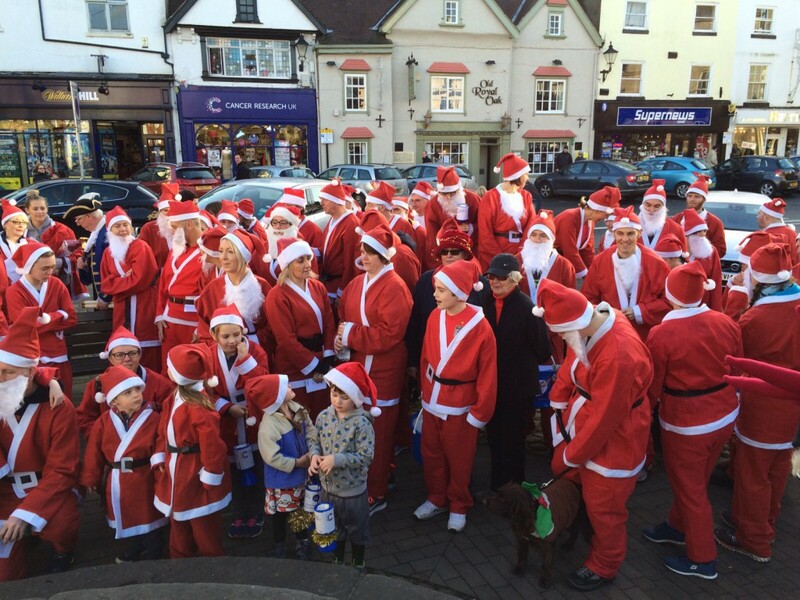 Mince Pies and Mulled Wine will be available (for donations) in the shop after the run. Spread the word and get all the family down to help kick off your Christmas celebrations in style (oh and maybe help walk/run/jog the Striders Xmas party hangover off!). Into November with a BANG! Remember, remember the 5th of November … as that’s when Striders took on (and concurred) some very large hills at the Guy Fawkes 10 mile race, speeded along Kirkstall Road at the Leeds Abbey Dash and got round the Gunpowder 10k before things went bang! It was a great Striders turnout of 18 at the Ripley based event, with Martin Brock leading them home into the castle grounds in a time of exactly 01:05:00. Recently returned member Stephen Morland had a strong finish (01:12:40) to hold off Nicola Carter (01:14:44). Ian Mitchell (01:16:01) had a battle with Sima Lowery (01:16:41), with Sean Brennan chasing them down as he completed the event for the first time in 01:17:28. Anthony Mulley and Gareth Conkleton were split by only 1 second, completing the ‘undulating’ course in times of 01:19:41 and 01:19:42 respectively. Stewart Hymas turned out in some ‘cool shades’ to record 01:21:02 and finish just under 2 minutes ahead of the ever improving Gary Wilkinson who clocked 01:22:58. Craig Mitchell and Georgina Townsend battled it out in the last mile to both come in under the 90 minute mark finishing in 01:29:13 and 01:29:36 respectively. Kez Welsby completed her first ever 10 mile event in 01:41:02, coming across the line with Deborah Goldfield who finished one second later! June Graham clocked 01:44:44 and was followed into the castle grounds by ‘raceaholic’ Dawn Richardson (01:46:49), Katie Gray (01:52:27) and Jo Gray (02:08:24). Emma Greveson headed over to York for the new Gunpowder 10k event which was based at the racecourse on the Knavesmire. She completed the course in 01:17:36. At the Abbey dash in Leeds, the club was represented by 8 members and Guy Close was the first one across the line in a 10k PB time of 37:09. Conrad Garcia was the 2nd Strider back, completing the course in 43:53. Claire Baxter secured a PB over the distance (48:53) and she was joined at the popular event by Ryan Middleton (49:12), Vanessa El-Etriby (55:22), Julie Elmes (58:44), Laura Wilmshurst (01:01:18) and Bill Kirkpatrick (01:06:47). On Sunday, a new event at Bolton Abbey took place and attracted 9 Striders across three different events. Each of the events (10km, 10m and Half Marathon) were multi terrain and had some decent hills within them! In the 10km race, Paul Heywood finished in 01:02:33 to head a Striders entry of 5 within the event. Next back was Nikky Christie (01:07:12), followed by Edna Wood (01:18:44), Julie Elmes (01:25:54) and Dawn Richardson (01:32:11). Deborah Goldfield was the sole Striders representative in the 10 mile event. She picked up her medal after clocking a time of 02:23:11. The Half Marathon had 3 Striders taking part and they were led home by Dave Christie (01:41:41). He was joined by Gary Wilkinson (02:24:26) and Lisa Harrison (02:42:34). Julie Elmes has been representing the Striders at the West Yorkshire cross country events. Race 1 was ran over a 6km course in Wakefield on the 14th October. Julie completed the course in Wakefield in 34:54. Race 2 was held on 29th October and took place within Nunroyd Park in Leeds. The multi lap race was finished by Julie in 34:48. Sue Morley has been busy up in the fells achieving some excellent results. On the 4th November she took on the Bronte Fell Race which started in Lancashire (boooo!) and finished in Yorkshire (wahoo!) and was ran over a distance of 7.5 miles. Sue finished the event in 01:34:55. Back on the 15th October, Sue was joined by Edna Woods for the Gormire Gamble. Sue completed the course in 01:05:38, with Edna completing her first ever fell race in a time of 01:16:48. Our Social Reps have added some important details to the Social event page regarding the Curry Night and Xmas Party – please see the updated page here.